When WestConnex was conceived, the plan was to build four new tollroads in three stages. Now, Sydney motorists face the spectre of of ten new tollroads in stages unknown. What of the tolls themselves, how high can they go? In this, the second story in our Blind Faith series, we reveal research from leading transport analyst and actuary Ian Bell which forecasts the impact of Australia’s biggest infrastructure project on Sydney motorists. The bids are in. Now the real negotiations begin, negotiations to sell a controlling 51 per cent stake in Sydney Motorway Corporation and its suite of tollroads. Transurban boss Scott Charlton, the hot favourite to win the tender, has been playing it cute. Like his rival bidders at Cintra and CIMIC, Charlton doesn’t want tension in the bidding process. He wants a bargain. Hence last week’s clear message, hosing down any prospect of a bidding war. We won’t be offering a high price, said Charlton, as our penchant is for plucking tollroads out of receivership on the cheap, roads which now make fabulous returns. Pay too much and you will go broke, is the warning to his rivals, and we will pick up your assets from the wastelands of insolvency. Herein lies the rub for the NSW Government and its advisors to the sale, Goldman Sachs. So many toll-roads have gone belly up in the wake of heroically overcooked traffic forecasts, that WestConnex buyers are wary. Their wariness will put a discount on traffic forecasts, a justifiable discount too, a discount for extra risk which will lend upward pressure to road pricing and downward pressure to the price the State will get for selling Sydney Motorway Corporation (SMC). The key for motorists though is how much the state will allow the winning bidders to charge in tolls. It’s a tricky caper; too much and drivers won’t use the roads, too little and the bidders won’t stump up the billions in cash to finance the construction. So it is that the State has shown a willingness to manage the projects and add new ones in ways which will entice the bidders to pay more. And as the private players attract state and federal funding support, taxpayers are on the hook also. “Tolls may rise 40 per cent to 50 per cent by 2040 (in real terms). But calculate the straight dollar-figure increase in tolls from today until 2040 and you get a 137 per cent. And it is not just about price, but about conditions. As an obvious example, what if Metro West was altered, obstructed or delayed because it helped increase bid prices? What if Sydney Gateway (already stripped from the WestConnex scheme) under RMS management (the NSW department of Roads and Maritime Services) somehow delayed the freight rail improvements needed to support the Port and Moorebank Intermodal because trucks use the WestConnex not freight trains? There are so many moving parts, so many unknowns in this hydra-headed transaction, it is frightening. For this story, based on extensive research of all the available public information by Ian Bell, we examine what Sydney motorists can expect to be charged in future tolls. As detailed in the first story in this series, public information is not adequate to make a decent financial model so Bell’s forecasts are speculative but they are the best to date. Australia’s largest infrastructure project has changed shape over the past five years like a gigantic chameleon. When the master plan for WestConnex was devised, it involved three stages and four individual tollroad projects. Five years later, the vision includes six new tollroads: the Western Harbour Tunnel, the F6, the Northern Beaches Link, the Harbour Bridge and Harbour Tunnel northbound tolls and the Eastern Distributor southbound. The map shows what Sydney motorists face in coming years. It is both evidence of the inevitable national policy shift to “user pays” road networks. It is also evidence of the potential deluge of daily cashflows being dangled in front of wide-eyed bidders. “Nowadays we (analysts) run scenarios at 2 per cent to 2.5 per cent,” says Ian Bell of inflation estimates. “With the adoption of 4 per cent escalation (that is, above inflation) and the over-use of fixed-formula concession arrangements, the scope for the currently incoherent and confusing set of road charges seems likely to be much worse in 10-20 years’ time. Incoherence and complexity is a serious problem”. Bell reckons that if the per kilometre rate were based on a two per cent rise in CPI out to 2040, tolls would be 73c per kilometre. 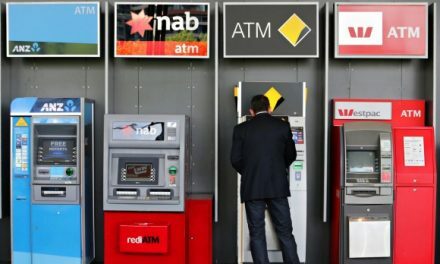 But with a 4 per cent uplift, the per kilometre rate would be $1.11, the flag fall $3.01 and the toll cap “at what seems an extraordinary $21.20” – almost 60 per cent higher that if inflation were to be constant at 2 per cent. The challenge with any analysis of WestConnex however is data secrecy. A good deal of the sensitive information about future tolls has only been made public via leaks to Sydney Morning Herald reporters Matt O’Sullivan, Peter Martin and Jake Saulwick. Citing leaked documents, Saulwick quoted a $4 toll for the M4 widening back in 2014. What is clear is that we now have a formula which escalates at 4 per cent rather than CPI, which is one of the main differences from the M7 precedent. The result of this is that the per kilometre toll at January, 2018, is 47c compared with 40c on the M7. 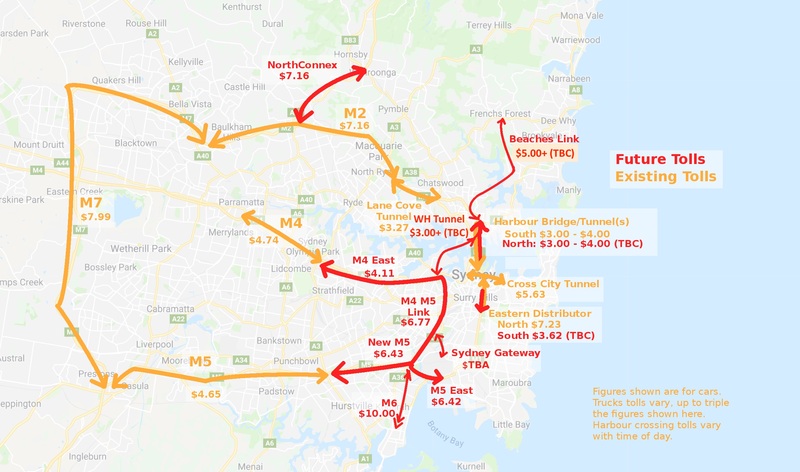 With only 38 per cent of WestConnex now built, existing toll prices have already forked higher than those on the M7. How high will they go? Bell says motorists will likely be hit by both both higher tolls and a higher number of roads tolled. 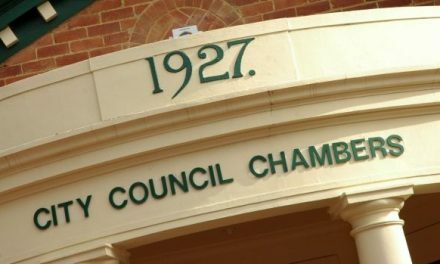 Ian Bell also see signs that the current documented annual escalation could be quietly changed to quarterly, as is the case for the M7, M5 South West and Lane Cove Tunnel concessions. Bell talks in “real” numbers rather than “nominal” but if you convert his estimates to actual dollars, the figures become scary. Relative to inflation, tolls may rise 40 per cent to 50 per cent by 2040. But calculate the straight dollar-figure increase in tolls from today until 2040 and you get a 136 per cent rise in tolls. deliver free car registration to drivers paying more than $25 per week on average in tolls. Bell says he and his associates are perplexed by this decision, which seems to fly in the face of Commonwealth policy direction on transport. “After so many efforts to apply “User Pays” to new motorway additions in Sydney, it seems a remarkable reversal; even a “User Doesn’t Pay” approach. 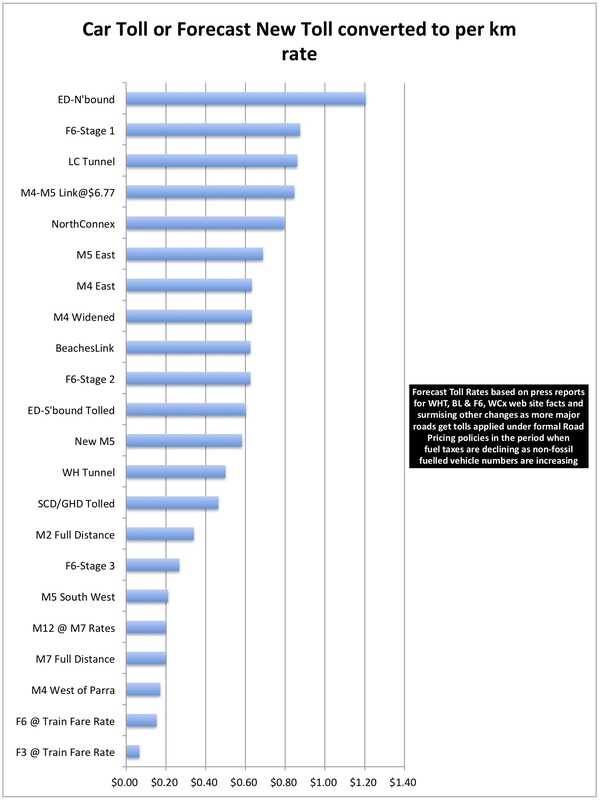 Ian Bell and his associates at Financial-Architects.Asia have released some tables for michaelwest.com.au which illustrate the kind of distance-based road user charges which seem to be emerging as WestConnex develops. The calculations are based on FAA’s research on road pricing methods, analysis of public information such as concession deeds, and credible press leaks. The first table shows the present tolling arrangements as at January, 2018. The second table shows likely future tolling based on analysis of financing demands and the business case. The third table is more speculative, showing which Sydney roads may end up also being subject to tolls. 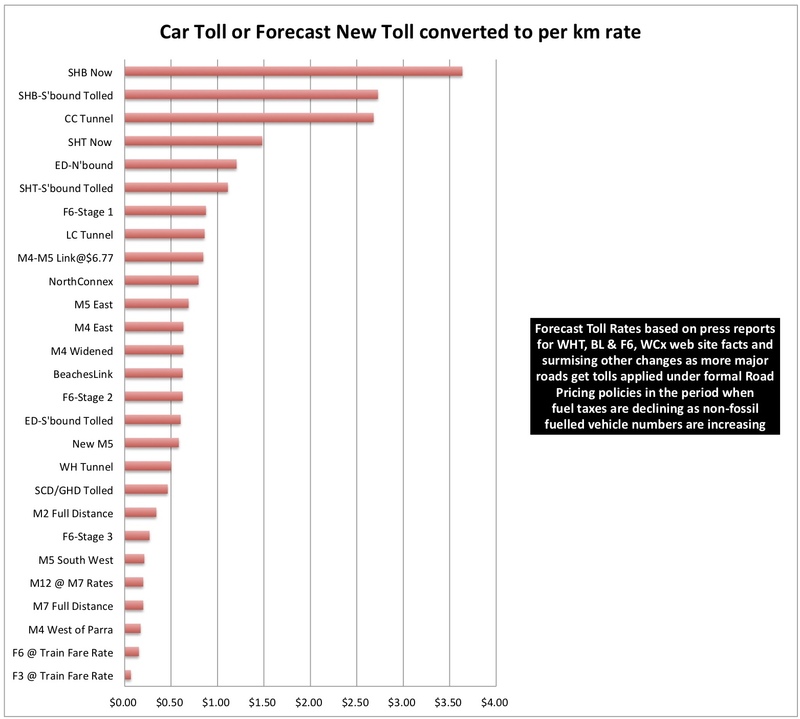 Table 1 reduces existing known toll rates for cars to a comparison of per km rates. Table 2 shows new motorways in planning, roads which are likely to be tolled. Ian Bell believes it is virtually a certainty that these roads are tolled as there would be no other way to fund the high cost of construction. “These represent the batch of new tolled roads that the State is using, it seems, to help it get a better price for selling control of Sydney Motorway Corporation. We asked Bell to go further and give us his firm’s thoughts on future road pricing developments. Table 3 (below) involves “a lot of speculation” he says, but it also “follows logically from what has been happening and from the Federal Government’s need to find ways to replace declining fuel taxes as the auto sector moves away from making fossil-fuelled vehicles”. Since the Henry Tax Inquiry, and this ground has been trawled by multiple economic experts since, the future of road pricing has become more clear. Federal Infrastructure Minister Paul Fletcher has said it might take a decade from now, but the future is user-pays, that is drivers will be funding roads via user charges – on what’s called a “mass-distance-location” basis. The word “mass” refers to weight, that heavy vehicles will pay more than light vehicles such as passenger cars. It already happens with registration charges. “Distance” simply indicates the further you drive, the more you pay. Finally, “location” implies that rates will be higher for capital cities than in the country. Also, there may be further differentiation in charges according to where your drive takes you. 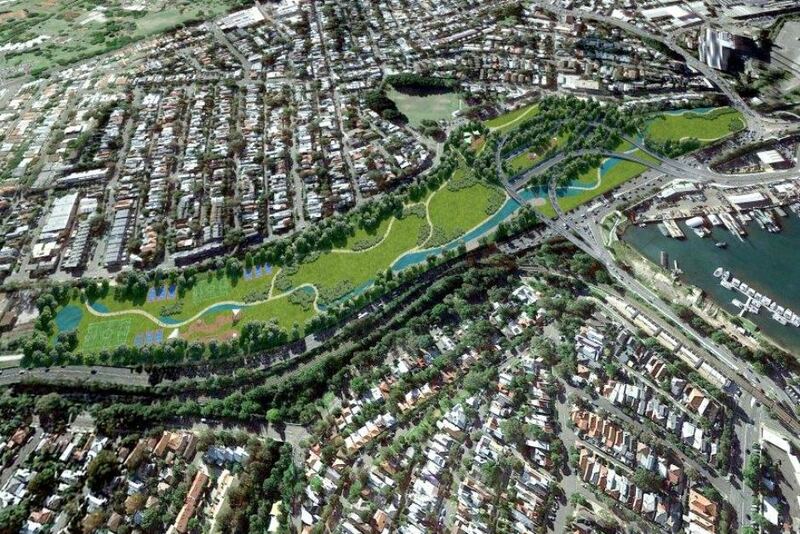 Due to project secrecy and the immense ambition of WestConnex, it is hard to know where the state and its advisors are taking us. Already, we know beyond doubt that one road has lead to another. Indeed four roads have led to ten. The uncertainties of engineering, costs, traffic risks, technology such as driverless cars and renewable energy make both the journey and the destination impossible to predict. What will become of Sydney Gateway? Would high-speed rail have been a better option than the F6 as proposed? Will the Rozelle Interchange discharge so much traffic that Anzac Bridge will need to be tolled? As fuel excise stalls and starts to dry up, how will roads even be funded? What conditions will be granted the victorious consortium in the bidding for Sydney Motorway Corporation? Will they even be public? In the defence of the state government and its planners, it is no doubt preferable, when pushing ahead with grand transport plans, to attack the whole problem of congestion and a growing city in one go – rather than by ad hoc piecemeal projects. It may work. It may not. In 2040, commuters may look back and rue the day that mass transit solutions – trains, public transport – were not properly considered as an alternative to roads. We will touch on that in future instalments of this Blind Faith series. In the meantime, the questions are many, the answers a work-in-progress and the only certainty is uncertainty.